Opinion Poll 2011: What is your favourite make of soft pastel? Which was your favourite brand of soft pastels in 2011? On the right you can see the chart which presents the results of my opinion poll which asked this question in a year long poll held in 2011 on my Pastels - Resources for Artists website. Unison remained way out in front of all other brands and even grew its market share. Sennelier, Talens Rembrandt and Terry Ludwig all saw small increases in their popularity. It's interesting to also note that PanPastels have done well for a new product - recording just 0.8% in 2010, they've now grown to 2.7%. Art Spectrum Pastels also saw a similar increase from 0.8% in 2010 to 3.1% in 2011. Just in case anybody thinks there is any sort of European bias going on here, both this blog and my pastel resources site get at least half their visitors from the USA and a good representation from Australasia as well! 258 people responded to the poll in 2011 compared to the 361 voting in the 2010 Poll. However given the numbers responding, and the generally consistent pattern of responses it's reasonably certain that this poll indicates the pattern of overall preferences although minor changes year on year might be to do with sample size. Over on Making A Mark, I've highlighted the fact I'm planning a new project on that blog which will focus on the production of books by artists or those working in the art field. As a result I'm switching the regular monthly posts about art books to Making A Mark Reviews - and this is the first. The book market continues to change. It's very evident that it's now absolutely impossible to ignore the power of Amazon which seems to have ambitions way beyond its present set-up. That's partly because a lot of their business is now done via third party book retailers. #2 What type of book sells most? #3 How important are free ebooks? In the middle of the range for the top 1,000 Kindle books, it appears that free eBooks “outsell” paid eBooks by a ratio of more than 5:1 . Free is fine so long as it is also good quality. Free which is dross only serves to downgrade the listings and submerge the better quality books so they never surface in the Amazon listings. The Amazon charts favour new books: Amazon's focus is sales and they obviously think that the emphasis needs to be on new books. However rankings which favour latest sales are worthless within the context of the bigger picture. My analysis of the available data in the past suggests that there are some art books which continue to sell well for a very long time - as well as selling much better than new books. However it's now far more difficult to identify these due to the way books are now listed. Which I guess makes my listings a bit more important than I anticipated they might become when I started. Self-publishing: The Amazon charts are beginning to become swamped by author driven books - which might be good but for the fact that they are of extremely variable quality - and not necessarily written by the author! I cannot over-emphasise how much complete and utter dross now inhabits the listings! Those that are being priced very cheaply seem to sell well. That doesn't mean to say they're any good or that they will sell well in the longer term. Some are complete rubbish - take a look inside this one. However cheap and free books seem to be successful at submerging books which deserve to do well - but now find it much more difficult to get into the lists. That just spells more and more problems for the traditional printed book produced by the traditional publisher. New formats: The charts are also being swamped by the production of old books in new formats. There is no new book only a new format. In general I'm finding that the Amazon.UK listings are lot less adulterated than the Amazon.com listings, plus they enable me to screen out the free Kindle books. I anticipate that my listings for 2012 might well draw more heavily on the UK pages than hitherto. The listings for January 2012 certainly have a more mid-Atlantic flavour. 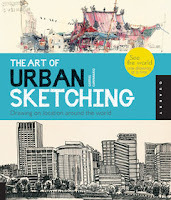 Drawing: The major story of January 2012 is the way The Art of Urban Sketching: Drawing On Location Around The World has topped both the drawing and painting charts but since it can only top one in my charts, I've gone for drawing. It also rides high in art history charts but how it justifies that is beyond me! Painting: James Gurney's Color and Light: A Guide for the Realist Painter continues to be the top rated painting book. However finding the best seller (given that the urban sketching book could only be top in one category) proved to be a tad more difficult. In the end I selected a book which was doing well in charts on both sides of the Atlantic. Artists: Having changed the categories because I was finding books about an artist were straying into painting and art history, I then find that January is not awash with popular or top rated books about individual artists. There's many more fantasy artists and photographers getting good ratings compared to books about fine artists. Art History: I've retired the Hare. I can't cope with the idea of yet another variation on this theme. I am BORED with a very small hare with an amber eye. Interestingly I think people are now buying it because people have bought it and it's a best seller - because when you look at the "wished for" books it's not quite so high! The Louvre: All the Paintings now becomes the top rated art book in recent times. I think however it's a book which is ultimately destined for the shelves of libraries. Art Business: This section has been home to a curious turn of events. A new art business book has stormed the rankings for one month only. Last month's top rated book now languishes at #78 in the best selling art business books - and there have been no more reviews. I've been thinking why this might be and the only explanation I can come up with is that the glowing reviews did not translate to sales. I have to say I'm always very wary of books which suddenly have a vast number of 5 star reviews - it never seems quite real to me - unless the individual has a strong and well known track record. Check out The Best NEW Art Books in January 2012. It's getting really difficult picking out good new art books is the main conclusion this month. It's been getting progressively worse each month but it seems to have gone up a notch this month. The main problem is wading through the books which I won't include in my listings. However there are LOTS of new drawing and painting books published in January 2012 - some in ebook format for the first time.